A love-struck girl's quest for a Bible quiz championship becomes a journey of self-discovery in the charming and poignant Bible Quiz . The award-winning, critically acclaimed film arrives on Digital Download and DVD on June 10, 2014, from Virgil Films. Bible Quiz is hot off heels of a successful theatrical from Slamdance Studios, the rapidly expanding distribution arm of the Slamdance Film Festival. 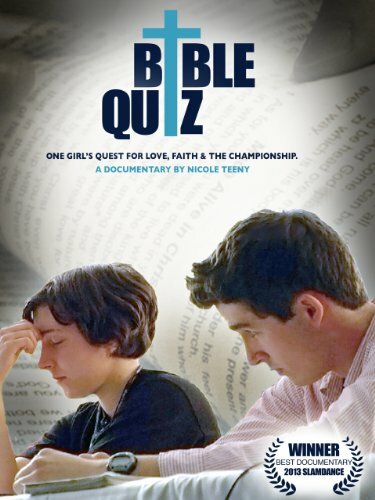 Bible Quiz had its world premiere at the 2013 Slamdance Film Festival, where it won the Grand Jury Prize for Best Documentary Feature, as well as being chosen to join Slamdance's acclaimed On The Road series in 2013. Its other honors include the Jury Award at the United Film Festival: San Francisco and the Local Audience Award at the Tacoma Film Festival. Nicole Teeny's debut feature explores coming of age in the face of faith, doubt, fierce competition, sexuality and love. Mikayla Irle is just like any other normal 17-year-old girl with a crush; except unlike other girls, Mikayla has memorized more than several books of the Bible - more than 2,000 verses - and the object of her affection is her studious Bible Quiz team captain, JP. But this year JP only has eyes for the National Bible Quiz Championship. Last year he placed third and now he is determined to win. In order to succeed, though, he and Mikayla must compete against thousands of other teens from across the U.S. Mikayla hopes that if she can help lead her team to victory she will find the love she lacks in her own family and win the ultimate prize: JP's heart. Bible Quiz challenges stereotypes and presents an even-handed look at religion in these teens' lives as they explore faith, identity, sexuality and competition at one of the most unique summits in evangelical America today. Bible Quiz had its world premiere at the 2013 Slamdance Film Festival, where it won the Grand Jury Prize for Best Documentary Feature. Its other honors include the Jury Award at the United Film Festival: San Francisco and the Local Audience Award at the Tacoma Film Festival. The Hollywood Reporter called it "instantly lovable," while Roboapocalypse said it's "easily one of my favorite documentaries of all time."